In an effort to comply with new public health guidelines, KFC U.K. will start experimenting with a vegetarian version of its Original Recipe chicken. That’s right. Nonchicken chicken. A faux foul. Still with 11 herbs and spices, though! As the Washington Post reports, the move is prompted by new recommendations from Public Health England that say British adults should be consuming only 400 calories at breakfast and 600 for lunch and 600 for dinner. KFC’s goal is to remove 20 percent of the calories per serving by 2025 (PHE’s suggested deadline is 2024). KFC isn’t the first fast-food chain to experiment with meatless dupes. As the Post notes, McDonald’s introduced a soybean-based McVegan burger to its locations in Sweden and Finland late last year. And this past spring, White Castle debuted a slider with a plant-based patty (a partnership with Impossible Foods that, surprise, debuted in Brooklyn, N.Y.). Those moves weren’t inspired by new regulations but by the bottom line: Millennials have been shunning fast-food restaurants, and chains are cooking up new ways to appeal to those customers. KFC’s head of food innovation for the U.K. and Ireland, Victoria Robertson, says that coming up with a vegetarian version of the Original Recipe chicken will be challenging. 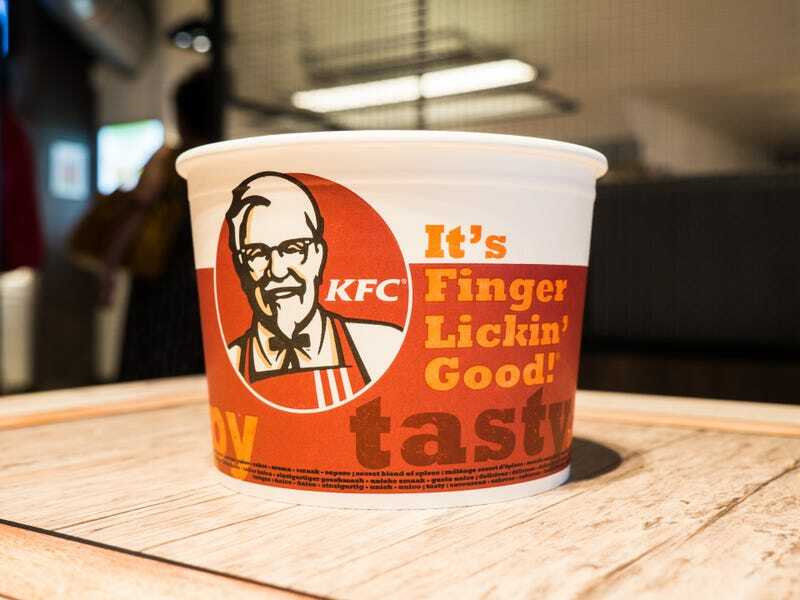 “Our fans absolutely love our Original Recipe chicken, and we won’t be changing the colonel’s secret recipe of 11 herbs and spices,” Robertson told the Daily Mirror. Me, I’m just shook that KFC was still using chicken this whole time. KFC’s nonchicken chicken is slated to debut later this year in the U.K. So far, there are no plans to bring it stateside.